It’s hard to describe the size of CES becuase it’s really, really big. This is a photo of *part* of the South Hall of the Las Vegas Convention Center. There’s also a North Hall and Central Hall, the Hilton Venue and the Sands Venetian Convention Center (though that venue was a lot smaller than last year. Still, the early numbers suggest attendance was up this year even as total exhibit space appeared to be somewhat smaller and the “party food” metric suggested that folks may have been scaling back somewhat despite the fact that this is generally considered the largest and most influenctial technology conference of the year (there is some dispute about that I understand as some conferenences have more attendees, though I think CES remains the largest in terms of exhibit square footage. 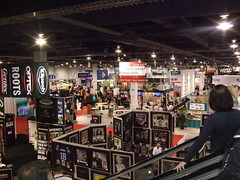 This entry was posted in CES10, conferences, technology and tagged CES, CES 2010 by Joe Hunkins. Bookmark the permalink.